The Dungeon Masters Guild Launches! Can you believe it? Wizards of the Coast has launched a brand new storefront, extending what was previously known as DnDClassics to allow anyone to sell Forgotten Realms based 5E content! And, the Dungeon Masters Guild now sells Adventurers League organized play Expeditions adventures which were previously only available through stores! Woah! Am I excited? Absolutely! You can get your hands on my Adventurers League adventure The Howling Void, and explore the inside of an air node just as the forces of elemental evil prepare to invade Faerûn. I am so glad that more people can play this adventure now! Having an iTunes storefront model for D&D (where everything is under one roof, ratings can show quality, lets WotC earn money, and creators receive a cut) has long been something I wanted. This is true even as I have worried tremendously about the impact a robust Open Gaming License (OGL) would have on 5E. A proper model can help players and DMs find quality material and avoid the glut of poorly written content. I’ve been fortunate to have conversations with WotC over the years on this topic and I think the Dungeon Masters Guild is a solid system. One of the interesting Questions for creators will be whether the Dungeon Masters Guild storefront offers enough of an advantage over self-publishing. OneBookShelf is the company owning DriveThruRPG, DnDClassics, and Dungeon Masters Guild. When you write for the Guild, you get 50% of the sale price. OneBookShelf and Wizards get the other 50%. Publishing through the Guild lets you use a far greater amount of material, use the Forgotten Realms setting, and benefit from any promotion Wizards may provide. And, Wizards says they will use the Guild as a way to identify talent. As other authors create adventures for the Dungeon Masters Guild and expand the Forgotten Realms through their titles, you then have access to use that material in turn. Was there a subplot another author didn’t fully explore? A tavern you’d like to re-use in your own adventure? All Dungeon Masters Guild authors contribute to a pool of community content that can be re-used, expanded, and explored by other authors in the Dungeon Masters Guild community. That idea of feeding off of other works is really cool. I could publish an expansion to Howling Void, taking you into each of the nodes. Or, you could do that. That’s really interesting! You have to respect IP and copyright, and the material can’t be offensive. Yay! You can instead publish through the OGL directly on OneBookShelf and receive their standard 65% of the sale price, or 70% if you become an exclusive partner. To publish with this new OGL you have to write material that isn’t based in the Forgotten Realms and using only the rules in the System Reference Document (SRD) instead of the much greater material found in core books and supplements such as the Sword Coast Adventurer’s Guide. Is that worth an extra 15%? You could also find other ways to publish that provide you with a greater cut and still use the OGL. It may be possible to do all of the above, publishing on the Guild and still publishing a “sanitized” version that uses only the OGL and no setting content. It will be interesting to see what some of the proven creators and self-publishers will do! Presumably we will soon hear from the Adventurers League on what it means to be able to now buy Expeditions adventures and, presumably, play them at home. Does this signal any other further changes? This could be a very interesting year to attend the Winter Fantasy convention, which has a rich history for introducing changes! While I’m excited to see some of my favorite authors and new authors to have a new way to express themselves and get paid, my greater priority is the strength of D&D itself. The previous OGL for 3rd edition trained some great authors, but it also spawned countless terrible adventures, bloated sourcebooks, and useless guides to things no one needed to read about. It also drove many publishers to abandon their innovative systems and convert their games to d20-based systems. The OGL caused a major crash for third parties and gaming stores. And, it is what allowed the creation of Pathfinder, which significantly altered the gaming landscape making it even more about D&D (now in two flavors) rather than about D&D and other true alternatives. It has taken a decade for the industry to recover and begin to properly diversify. The Guild may also have ripples across the industry. A new way for authors to get paid has just shown up. Do they want to get paid less than .02 cents per word, or publish on the Guild and get 50% of the cover price? Does this change the pay rates third parties offer? They still have the same challenging profit model… so if they can’t afford to pay more, what happens? Maybe we get lots of new authors. Maybe the industry could change positively, raising its rates? Maybe as consumers we can pay more, as we likely should? My hope is that this version of the OGL provides enough control and incentives to prevent the worst scenarios from repeating. A big part of this will be how we as authors behave (creating valuable content, not make-a-buck trash) and how consumers behave (being smart around the buying choices they make, being willing to pay for quality). Today’s market is different one than in the early 2000s – far more connected – so I suspect this will overall be a positive development for D&D and still for the gaming industry. I trust today’s designers to be able to make a cool D&D product and still work on a different innovative system. And, I am willing to see a few fires here and there if it can contribute to my favorite designers making a better living. Read the information on publishing for the Guild. Download the Systems Reference Document (SRD) and how to publish under the Open Gaming License. A full list of all resources provided for download to help Guild authors. Wondering what authors you can trust for great content? One of my favorite authors, Shawn Merwin, has written The Five Temples of the Earth Mother with Chris Sniezak. My Adventurers League organized play adventure, The Howling Void! 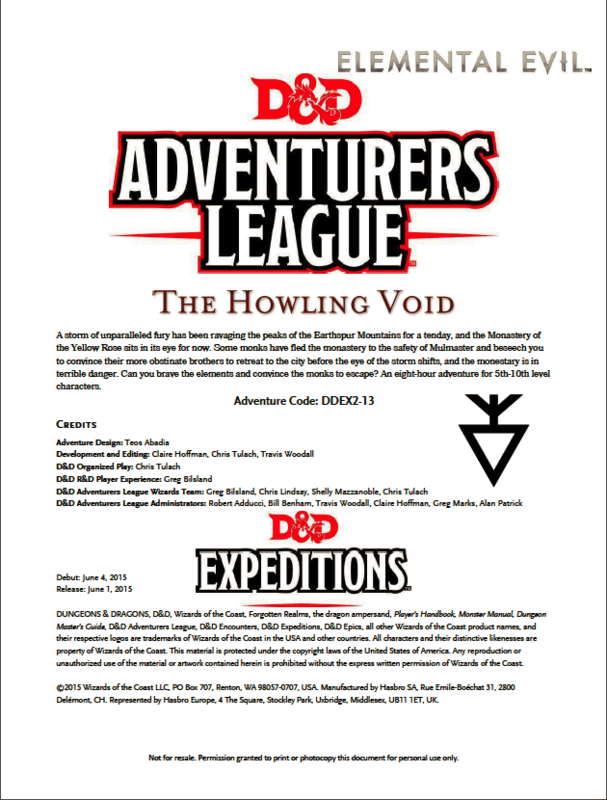 A bundle of the entire Elemental Evil Adventurers League storyline and supporting rules documents, including The Howling Void. Prospective authors, here’s OneBookShelf’s useful blog about pricing! Great breakdown thank you, I didn’t know that the OGL for 3.0 had such an impact on the industry. Thanks for the great article. Very informative. 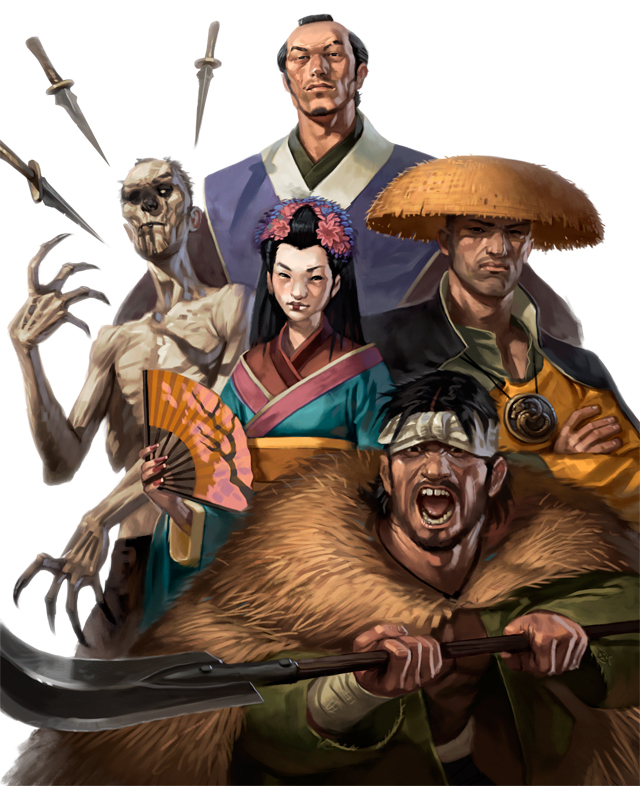 This entry was posted on January 12, 2016 by Alphastream and tagged 5E, Authoring, Forgotten Realms, Kara-Tur. Falling Star Sailing Ship – Unboxing! Richard Green on Falling Star Sailing Ship – Unboxing! We Need to Change the Way We Think of RPG Products – World Builder Blog on What is an Adventure Worth? 2018 DM’s Guild Sales Review | the scheming dm on What is an Adventure Worth?